Our 30th President, John Calvin Coolidge, Jr. was born on the 4th of July in 1872. Coolidge had a very successful career in law and politics, especially during his Presidency. Throughout his life he was criticized for his quiet manner. However, in retrospect, it could be said that his reserved demeanor actually fueled his success. Calvin Coolidge experienced hardship early in his life. His mother died when he was only twelve. His father and grandmother made every effort to support him, but even Coolidge himself acknowledged that he never fully recovered from this loss. For his entire life he carried with him a locket containing his mother’s portrait. Then, five years after his mother passed away, Coolidge lost his fifteen-year-old younger sister Abigail. It is certain that these tragic circumstances impacted the young man’s perspective on life. Later, in 1924 he would suffer another loss when an infection, caused from a blister playing tennis at the White House, would sadly take the life of his teenage son, Calvin Coolidge, Jr.
Another powerful force in the character of Calvin Coolidge occurred during his college years. Upon his graduation with honors from Amherst College in 1891, Coolidge held great admiration for his professors. Years later he would mention the impact their teachings had on his own character. He had become grounded on his faith in the common man – that hard work and giving had great value. He believed in dedicating one’s self to public service for the benefit of the greater good, a sharp contrast to the common goal of self-promotion. 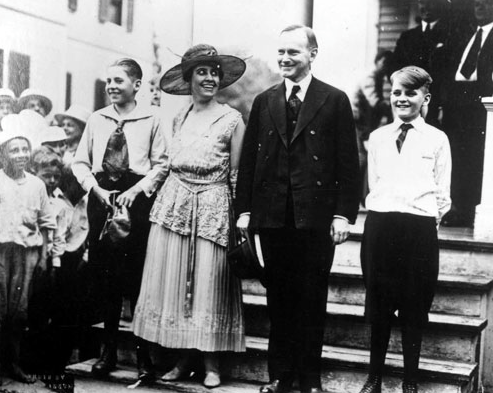 THE COMPLETE COOLIDGE FAMILY: JOHN, GRACE, CALVIN, AND CALVIN COOLIDGE JR. In pursuit of his goal to practice law, Coolidge secured an apprenticeship with a prominent Massachusetts law firm as an alternative to bearing the cost of law school. In 1897, Coolidge was admitted to the bar and in 1898 he opened his own law office in Northampton, Mass. Once he began to achieve personal success, he still felt as if he was missing a companion to share it with. In 1905, Coolidge met Grace Goodhue, a teacher at a local school for the deaf. They married that same year in her parents’ home in Vermont. Together they had two sons, John and Calvin Jr.
Coolidge began his career of public service while practicing law. He was first elected as Northampton City Councilman in 1899, then General Court Representative, Mayor of Northampton, State Senator, Lieutenant Governor, and then Governor of Massachusetts. In 1921 he was elected Vice President of the United States where he served until the sudden death of President Harding in August of 1923. After completing Harding’s term, Coolidge was elected President in 1924. He declined the opportunity to run for reelection stating that if reelected, he would exceed 10 years as President, which he felt was too long. Coolidge retired to his home in Northampton. There the former President wrote his memoirs and political commentary. Sadly Calvin Coolidge died from a heart attack at age of only 60 in 1933. The enduring legacy of Calvin Coolidge was his steadfast character. During all of his campaigns, he did not criticize, or even speak the names his opponents. He remained focused on the issues at hand and talked about his views concerning government and business. Each election brought him broader support and greater margins of victory. He earned the trust and support of both business owners and the working class. His name has never been associated with any scandal or wrongdoing. Calvin Coolidge is best known for listening to the people and doing what they wanted. Raleigh DeGeer Amyx has spent the past 30 years acquiring museum-quality historical artifacts. He is proud to own personal effects of many past presidents including Calvin Coolidge. You now have the rare opportunity to view many of these important pieces. Many (400) of the museum-quality historical artifacts acquired by the Raleigh DeGeer Amyx Collection will be sold in a live auction in Boston, Mass. 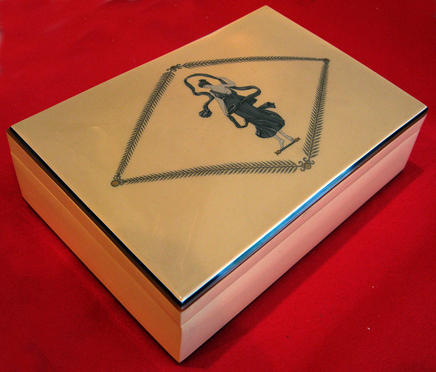 on September 17th & 18th, 2014 by RRAUCTION.COM. If you have interest in a particular item in the collection, please feel free to inquire using the form below. Recently, a very select number of pieces of Official White House China have been located. 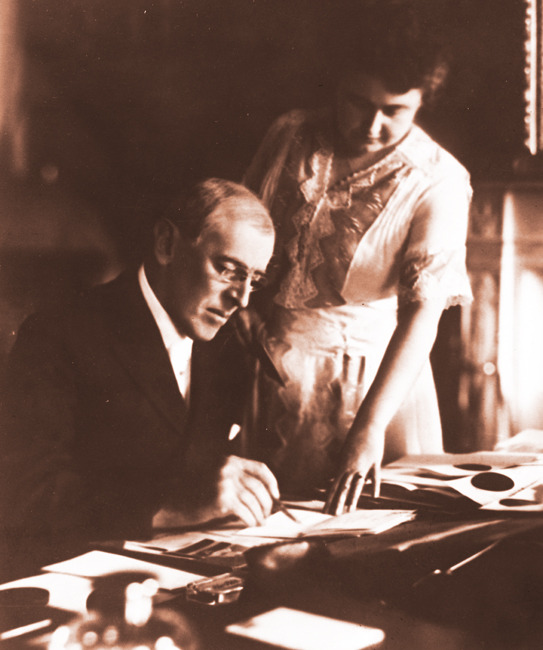 In 1918, President Woodrow Wilson; in conjunction with the First Lady, selected and acquired, perhaps one of the Top 5 most popular examples of White House China. The Wilson pieces represent, Executive Mansion Elegance.....at its total best. It pleases us to share an example of this elegance. 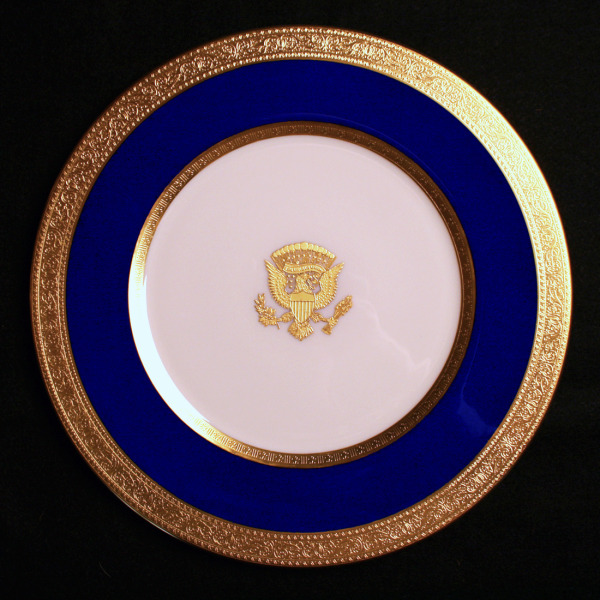 The 1918 Wilson State Dinner Service Plates came in two sizes (11.125" and 11.75"). The Woodrow Wilson China was manufactured by Lenox, of Trenton, New Jersey. For the first time, the White House had its Official China manufactured in the United States of America. By 1918, it had been fifteen years since any President or First Lady had ordered State Service; and that was when it was purchased by President Theodore Roosevelt in 1903. As it turned out the Wilson service was later received by other Administrations in a totally positive vein. 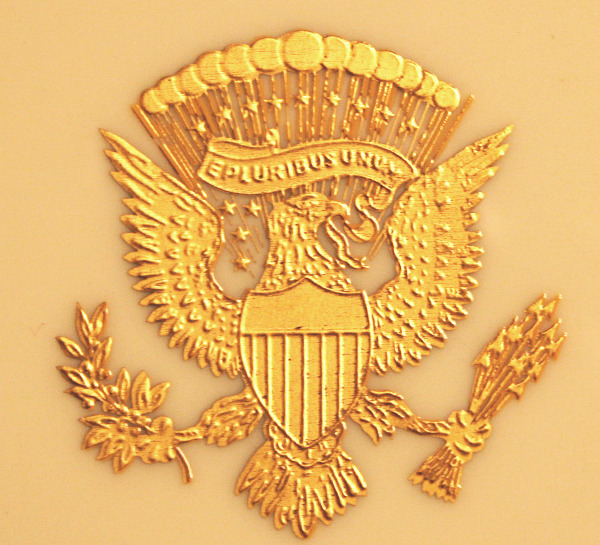 In fact, Warren G. Harding, Calvin Coolidge, Herbert Hoover and even William Jefferson Clinton ordered additional pieces of this exact same design. They felt it important to update this elegant pattern, in order to serve a larger number of White House guests, as well is to replace pieces due to chips or breakage over a period of many years. The stunning piece featured above is now in the Collection of Raleigh DeGeer Amyx. His Official White House China Collection now ranks in the Top 2 privately held collections in the world. 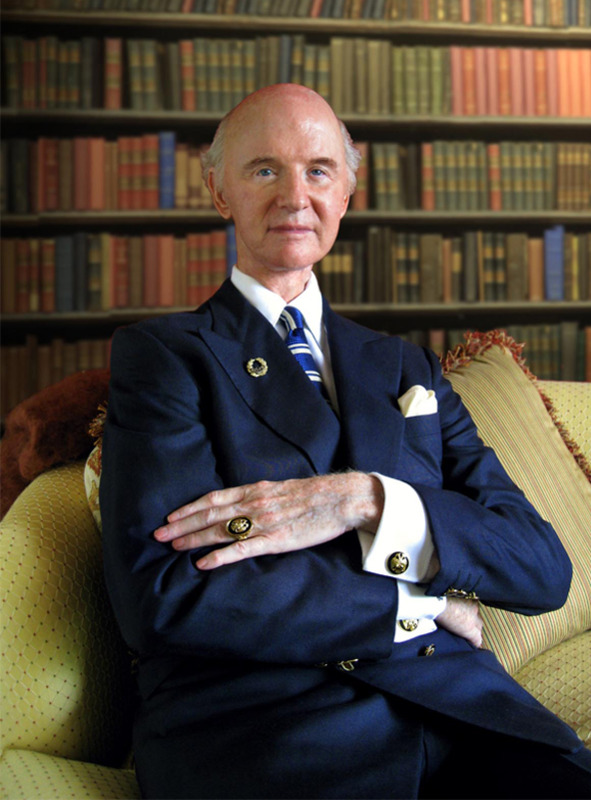 Other items in The American Heritage Collection AKA The Raleigh DeGeer Amyx Collection, have previously been loaned to Presidential Libraries as well as to non-profit entities of note.